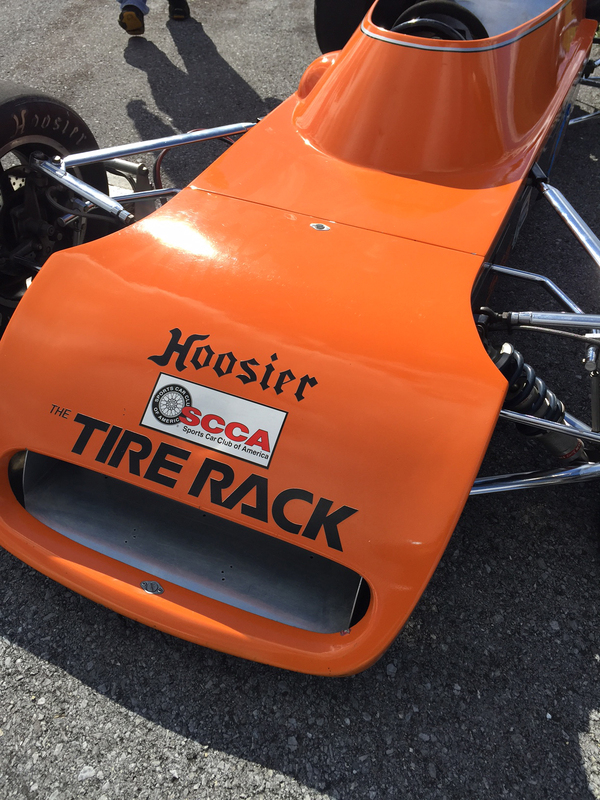 INVERTED SHOOTOUT CAPS ’17 SEASON – The Cumberland Airport Autocross Series closed 2017 on a similar note to its first motorsports revival event back in 2003. Three of original year’s cars entered and the fast guys and gals were coaching others in a quest for glory on the hallowed tarmac at CBE. Saturday’s Shoot Out format was a secret until returning from the lunch break in the split day-two heat format. Returning to a mini-driver’s meeting it was revealed (reality show style) that the bottom four raw time drivers in each heat would face off in the Bill Hartman Challenge..and the fastest four drivers in the opposite heats would spend their afternoon work assignment coaching the shootout drivers! Worked like a charm, to the enjoyment of all involved. Martin Valent’s evil SSM Toyota claimed another Cumberland FTD on Saturday, barely squeaking past Johnstown area driver John Ryan, in his nimble Dulon C-Mod open wheeler. The margin was a scant .025 seconds. The Saturday surprise was rising track star Robbie Wilson’s drive in the venerable Porsche 944 “7 Car”. Rocket Boy grabbed third overall and joined Valent and Ryan in an identical PAX podium. Derek Poorman’s beautiful LS-powered XP Datsun was fourth overall and Karl Loper led the ATK Crowd with a Top Five in his XP FFR GTM. 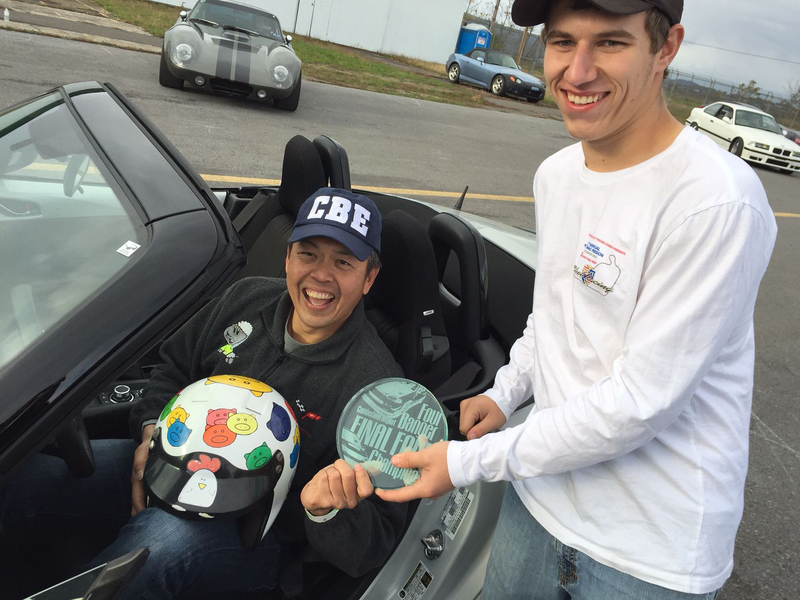 The shootout was filled with drama, two mechanical failures and a great final pair, in which Ted Haines battled his way to the final match before his HS Mustang fell to the CAMT ‘68 Charger of Steve Rodgers, whose coach (and fellow CAM driver) Eric Hartman shared the Bill Hartman Challenge Trophy. The first heat bracket included Kevin Moses, newcomer Shawn Cox, Haines and Troy Cunningham. The second heat bracket included Rodgers, Lee Terrill, Don Schlusmyer and John Porasky. Good sports and effective coaches, Martin Valent, Gary Miller, Karl Loper, John Ryan, Robbie Wilson, Carolyn Loper, Dan Hill and Eric Hartman made the event fun! On Seat Time Sunday, all-time FTD leader Matt Felten’s 44.054 covered Fairfax VA driver Jeff Duncan (also a former CBE FTD winner) in his 95 BMW M3 for the top spot. Jonathan Leyh was third in a Focus RS only a tenth of second ahead of Elazar Mann’s best ever finish in the Oreo Subaru SVX and Tink Phillip’s XP Daytona. Leyh won PAX fight ahead of STX combatants Jake Moran and Pete Harrison. 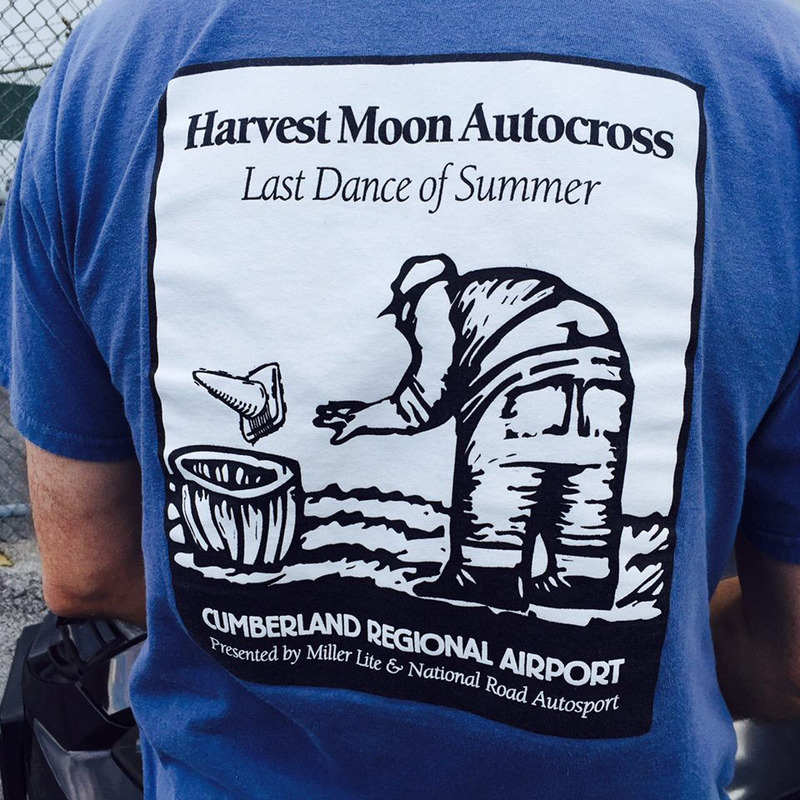 THROWBACK WEEKEND – It felt like the old days at Cumberland Airport’s 2017 Harvest Moon Autocross. Packed into two big run groups, doing morning and afternoon sessions, the weekend played to a familiar tune – back and forth battles for FTD and PAX. Both days were capped by definitive, drop the mic, hero laps that sealed the outcome. Unseasonably warm weather placed a premium on making the most of early runs and, on Saturday, Matt Felten’s BMod Reynard FC did just that in the morning, laying down a 39.819 pass that would turn out to be the day’s only sub-40 second run. Bill Staley, Jr’s muscled-up SMF Civic and Martin Valent’s Whiskey Rebellion champ SSM MR2 mustered runs of 40.504 and 40.556 respectively for second and third overall. Bruce Wesley in a Z51 Vette and Ben Bane in his SSM unnaturally aspirated Miata stole spots in the Top Five Overall from the usual suspects with a pair of late day banzai runs in the 41 second range. Wesley’s mad lap was also just fast enough to nip Staley’s Civic for the PAX win by .154 seconds. Rules for the Street Tire Challenge oddly accomplished their goal of shaking things up, but had an unexpected effect. Who knew that so many people would be on 200 tread wear gummies? The competition was nonetheless spirited, with some of top eight running as slow as 40th overall. Jonathan Leyh, Smooth Jim Harris, Steve Catlin and Robbie Wilson made the semis. Leyh’s Focus RS and Catlin’s ZO6 raced into the finals, with the Ford taking home a rare and collectible National Road Autosport mug for the win. Virginian Catlin proved himself again to be a strong match racer, making the finals now in all three of his CBE shootouts. Sunday was more of the same, but different, if that is grammar-possible. Martin Valent silenced all in attendance with a morning session pass of 37.095 (not a typo). Dogged pursuit for the rest of the day netted a “second second-overall” for Bill Staley Jr., a podium for Matt Parson’s Spongebob XP Miata, and Top Five finishes for Karl Loper’s GTM and Robbie Wilson in the Gyger Porsche 997 GT3. Sunday PAX, however, was the different story, as Valent’s daunting 2-second gap over the field in raw time was whittled down into tenths of the second by Wesley, Eric Coffman in the Kilmer Caymen and Staley Jr. Finally, at the very, very end of the day (like the next to last pass in the last run group) Pittsburgh’s Alan Eisenreich willed his conservative looking BS Audi S3 past Valent, capturing Sunday PAX by a mere .038 seconds. Pete Harrison in STX, Lloyd Willis in HS, Mark Sanner in GS, Bruce Wesley in AS and Matt Parson in XP had strong weekends, scoring double wins in hotly contested classes. CARS VERSUS NATURE – On the prospect of winning V8 and 4-cylinder shootouts, 134 entries graced the entry sheets on Summer Sizzler weekend. 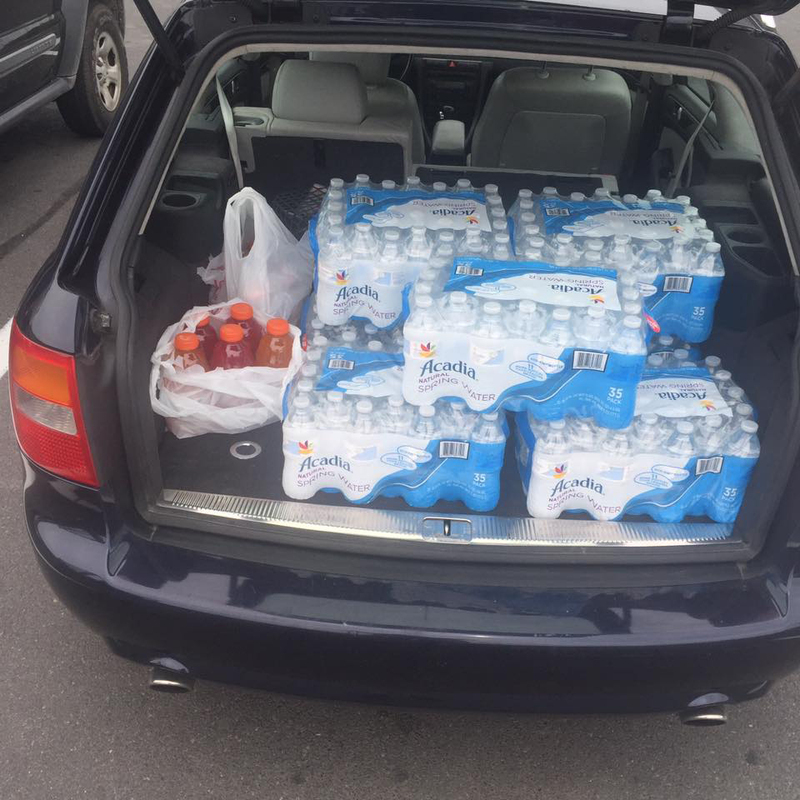 By Sunday night, all promises were kept…but not before another dance with the unpredictable upper Potomac River basin weather. An early afternoon wind driven deluge flattened pop-ups and moved the porta-pots, even destroying the 13 year old Short Gap Lions food tent, a CBE fixture. Run Group 1 was dry. After a stand down, Run Group 2 was damp but reasonable. Organizers surrendered early in Group 3 when the lightning arrived, closing the day’s racing and delaying the shoot out to Sunday. Among astericked Top Five Finishers, FTD Jeremy McCauley, Robert Kilmer, Rob Charnesky and Steve Caitlin all ran in the dry. Matt Parson in the XP LSV8m powered Miata snagged fifth with a impressive wet run in Group 2 that turned out to foreshadow Sunday results. The Sunday forecast was similar to Saturday, leading organizers and entrants to embark on an accelerated schedule get the day’s competition in before any precip arrived. Worked like a charm. Matt Parson rolled right from good Saturday wet session to Sunday dry FTD, followed by Steve Catlin, Howard Leikin, Eric Coffman and Tink Phillips in the Top Five Overall. Parson and Catlin then held serve all the way to the final round of the V8 SuperCar Shoot, trailering Eric Fargo and Karl Loper respectively in the semi-final round. In the finals, Steve Catlin’s ’08 ZO6 almost pulled a repeat of his Mason Dixon Shootout win last fall, running his best raw time of the day, 39.829, but whacked a cone in the showcase turn, handing the trophy to Parson’s LS powered Miata on the strength of a sold 40.032 pass. The four cylinder field was expanded to eight cars and was faster on average than the V8’s in qualifying times. Nobody had ANYTHING for 2016 Cumberland FTD Howard Leiken’s track beast Lotus. In winning the final round against Ken Bane’s sweet SSM Miata, Howard ran an astounding 39.192 second pass, well under Matt Parson’s event FTD time of 39.566. HOT PURSUIT – A robust two-day Cumberland Historics field of 138 entries boasted six former FTD winners…and looked full of promise for spirited back and forth performances. That is, until the Valent brothers rolled their evil SSM Toyota into the Cumberland Airport paddock. Under searing sun, Martin and Miro simply snatched everything in sight. 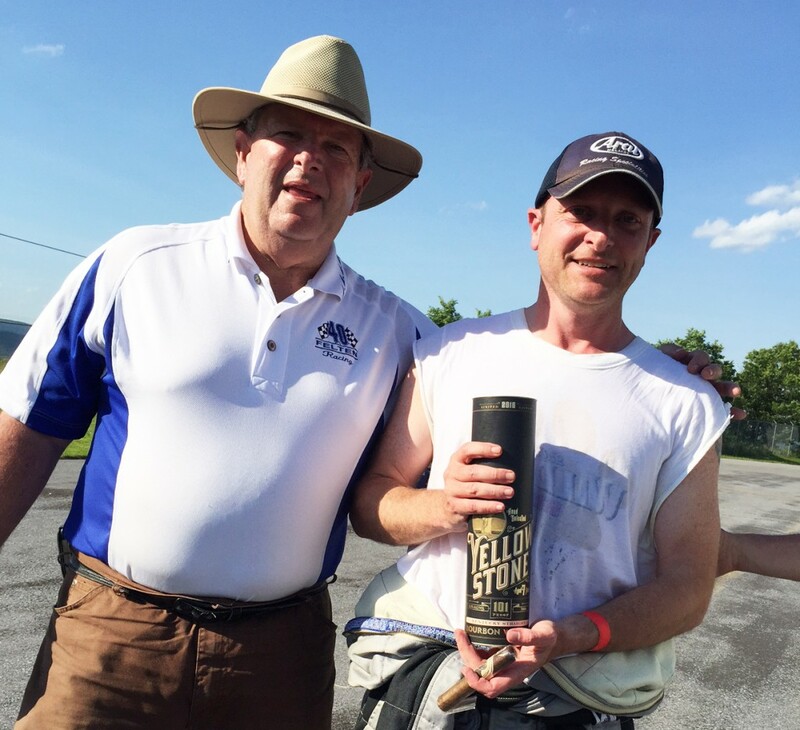 Carlisle Pennsylvania based car owner Martin won FTD twice, PAX twice and won the bottle of Blanton’s and a Pappy Van Winkle cigar with a methodical march through the 16-car Whiskey Rebellion Runoff field. Matt Felten (BM Reynard) and Steve Hoelscher (DP Toyota) gave chase all weekend, finishing second and third overall both days and meeting in an exciting semi-final match-up in the whiskey runoff, won by Felten when the Harpers Ferry based Toyota coned. 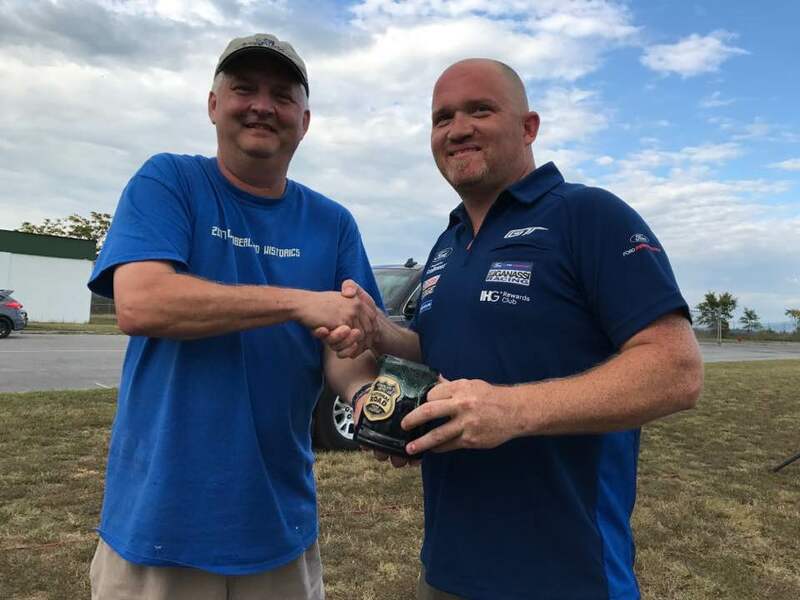 Gary Hughes (EM Stalker) was top five both days and the Jeremy McCauley/Matt Parson co-driving team took turns placing Don Fazekas’s beautifully crafted XP Miata in the Fast Five. Two-day winners in contested classes included Eric Coffman (SS Porsche GT4), Bruce Wesley (AS Z51 Corvette), Jonathan Leyh (BS Focus RS), Smooth Jim Harris (FS Mustang), Andre Downey (STX Subaru), Dan Hill (SSP Porsche), Martin Valent (SSM Toyota) and Jeff Duncan (SM BWM M3). West Virginians Jim Mason and Sean Halloran traded CP squeakers, with Mason’s 74 Mustang winning Saturday by .006 and Halloran’s Trans Am winning Sunday by .124 seconds. Sunday CAMT competition was a crowd pleaser as well, with Charles Trimble (Red Lion PA) dancing his Chevy Malibu over Eric Hartman’s stunning ’69 Camaro by .375 seconds. The 2016 Pumpkin Carve Weekend was planned to be a time to shine for PAX adjusted class racing. Shine they did, but only when enough light and dry tarmac appeared to allow racing. Day-long soaking rain on Saturday, compliments of Hurricane Matthew, forced one of the rare cancellations in Cumberland Autocross History – but Sunday’s exciting racing and dramatic PAX shootout delivered a great ending to good season at CBE. The belle of the ball during both morning and afternoon heats was the new-to-them 1974 Dulon C-Mod Formula Ford of John and Vicky Ryan. John was fastest in the morning in the 45 second range and in the warmer afternoon, scorched a 42.957 pass to secure FTD by a 1.3 second margin. The car itself also starred, immaculately turned out for a 42 year old machine. More newsworthy newness just behind as well, in the persons of rising track star Robbie Wilson, charging up to second overall in Dan Dazzo’s Cayman and local contender Ken Bane achieving the overall podium in his turbocharged SM class Miata. XP winner Karl Loper was fourth and the A Street winning Corvette of Pittsburgh’s Randy Pearson rounded out the Top Five. 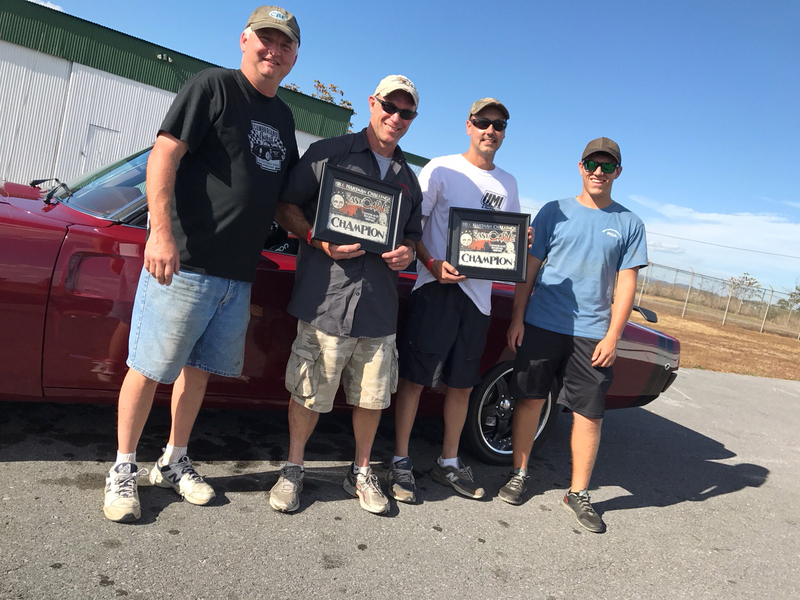 Strong performances in the class contests included Eric Hartman’s win in CAMT in his gorgeous ’69 Camaro, topping a five car group, and Philadelphian Andre Downey’s drive in STX. A six-car gaggle in G Street ended up with former Cumberland FTD Dan Whiteman edging Bethel Park’s Bob Killmer in a battle of Focus STs. The Pumpkin Pax Shootout was a total hoot, pure and simple. Lucas McKenzie was the surprise to top indexed qualifier, but he and Dan Hill, who drove himself into the field late in the day, were both off in their match-up, a first for CBE! On that side of the bracket Jeremy McCauley edged Eric Coffman in an epic quarterfinal pairing by a scant .04 seconds. On the other side of bracket, veteran Smooth Jim Harris and upstart Robbie Wilson trailered car after car on their way to semi-final clash that went to Harris on the strength of metronome consistency in the mid 37-second PAX range. In the final, both Harris and McCauley drove their best laps of the shootout. Smooth Jim’s 37.104 covered the Pennsylvanian’s 37.421 to grab a popular special event title at CBE! With nearly 1,000 people at the Cumberland Airport over the busy Harvest Moon Autocross, 175 entries tangled in a Mason Dixon Shootout weekend that ended up pretty much like the real one. Early Southern victories followed by Northern triumph. With eight slots in the shoot-out on the line for drivers on either side of the Mason Dixon line, focus was razor sharp among the fastest Saturday entrants – resulting in the tightest finishing overall Top Five in Cumberland Autocross history. Veteran Virginian Gary Hughes in his Bruton Stalker ran a lap for the angels to secure FTD with a 42.584. Karl Loper’s GTM was only .098 behind, edging top Pennsylvania qualifier Matt Parson by a mere .001. Steve Caitlin’s SSR C6 Corvette was fourth, .195 seconds back and Jeremy McCauley was just .057 behind him. In the fourth run group, there was a “whole lotta bumping goin’ on” with Jeff Schliffka racing his way into the eighth Team PA slot and Rocket Robbie Wilson driving his 944 Cup car up into seventh on the World Team late in the session. On the left side of the shoot out bracket, PA#1 Matt Parson and World #2 Karl Loper moved without incident to their semi-final showdown. Then, oddly, Parson laid down a sizzling lap but looped after finish (a DQ in Cumberland), Loper was faster in raw time, but snagged a late cone. As the two drivers mulled over the feeling of kissing their sister, they agreed to a gentleman’s do-over! The gracious Karl Loper finished the job clean to make the final. On the right side of the bracket, upsets ruled. In the first round, Jeff Schliffka took out World #1 Hughes and World #6 Jake Moran trailered PA #3 Wesley. World # 3 seed Steve Caitlin dispatched upset-mind Schliffka in semi-finals to reach an all-World final. Virginia reclaimed West Virginia in the final as Caitlin’s C6 ran mid-42s again to win the first Mason Dixon Shoot Out in impressive style over ever-faster rocket maker Loper. With the field now up to 95, perhaps anticipating the Motorcycle Cannonball lunch visit, very tight competition at the top of the field continued. If the South won Saturday, the outcome favored the Union side of the Mason Dixon on Sunday. Oh-so-close several times this year – Matt Parson in Don Fazekas’ LS3 powered XP Miata broke through at the Harvest Moon and captured his first Cumberland Airport FTD, with a smokin’ 42.021, edging Summer Sizzler FTD Howard Leikin by .091. Usual suspects Hughes, McCauley and Loper filled out the Top Five, each only a tenth or so ahead other with all five packed within .540, again unusually close for Cumberland. Smooth Jim Harris, bubble bump victim on Saturday, rose above the field to win Sunday PAX, edging up-and-coming Ford driver Jonathan Leyh’s beautiful Focus RS by .091. First time Cumberland entrant Chris Cann made the podium in a well-driven MR2, another tenth of second back. 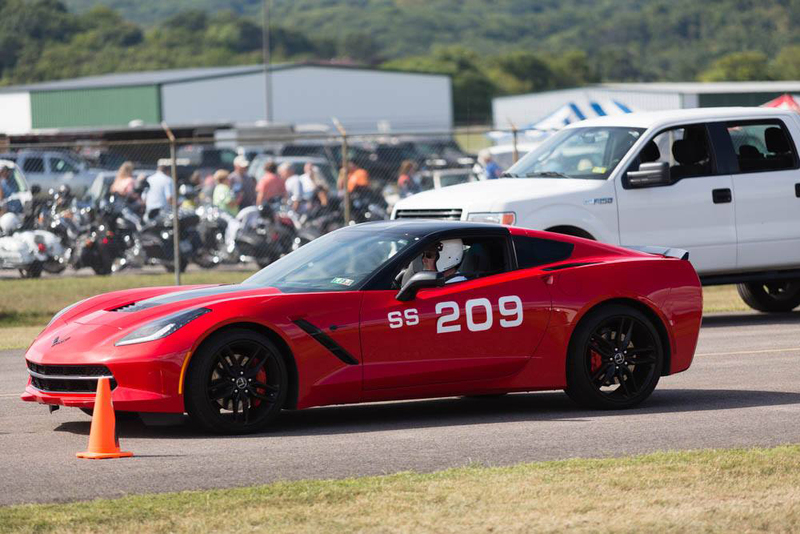 The 2016 Cumberland Airport Summer Sizzler Autocross lived up to its billing in every way. As organizers scrambled to keep entrants hydrated and rotated in the hottest weather of the year, the drivers put on a sizzling show on Cumberland second autocross weekend of the year. The new Dodge Hellcat and Ford Focus RS made Cumberland debuts in a Saturday field that included prohibitive FTD favorite Matt Felten. Day One featured a quick short course with great visuals and a fast open return route from the Medivac end. Felten dominated both morning and afternoon sessions of the split day format, covering the field in his BMod Reynard FC by 1.321 seconds. The low winning time of 37.405 stands as proof positive of the wide open course layout. A gaggle of drivers within 8/10s of each other filled out the Top Five. Silver Spring SSM class Lotus shoe Howard Leikin continued his march to the top of the CBE field with a strong second overall, edging Gary Hughes’s open wheeler by .044. Friendly rivals Karl Loper and Tink Phillips placed their XP class cars in fourth and fifth. Bruce Wesley’s AS class Shelby GT350 was the PAX winner. Other Saturday standout performances included Jonathan Leyh’s run in the Focus RS, snagging 9th overall and 4th in PAX and Doug Macy’s drive in STX, topping a six-car group. Mountaineer campaigners Sean Halloran and Jim Mason staged a great show in CP with Halloran’s Formula Trans Am edging Mason’s raucous ’74 Mustang by .148 to win the class. Day Two dawned without Felten in the field and a fight followed among the usual suspects with a chance to grab a career-first Cumberland FTD on the line. Even hotter temps and a bit trickier course did not deter Howard Leikin’s Red Rocket from snagging his first Fastest Time of the Day at the airport, by a scant .033 over a determined Karl Loper. Gary Hughes was third again, followed by Tink Phillps and Ken Bane’s turbo Miata. the second SSM car in the Top Five. Smooth Jim Harris from Reston VA in 2015 FS class Mustang topped the Leyh Focus RS for the PAX laurels, followed by Leiken, former FTD Dan Whiteman’s Focus ST and Bane in the Top 5 adjusted time results..
Chris Fritz’s dominating drive over a seven-car Street Mod field, and a battle between newcomer Victor Adamson’s Honda Civic and Corey McKenzie’s majestic Volvo in HS were among Sunday’s best performances. The Cumberland Autocross Nation gathered for the annual Historics Weekend with heavy hearts. Tasked with honoring former champion Wade Chamberlain, the CBE field went out and staged a competitive show worthy of his memory. All time Cumberland FTD record holder Matt Felten ran clean and fast late passes on both days to capture two more overall crowns, taking Saturday by .286 and besting the Sunday entries by .449 in his familiar B-Mod Reynard. Saturday’s top chaser was Pennsylvanian Matt Parson in the LS3 powered Miata XP -a car many are touting as Cumberland’s FTD heir-apparent. Pax winner Larry Casey was half a second back, followed by Jay Parsons in his DP class Miata. Chris Carlisle from the North Hills Gang scored his first-ever Top 5 in Jay Gyger’s sweet “Burple” Porsche GT3. SCCA regular Stephen Catlin topped of his good weekend, moving from 6th overall on Saturday to 2nd on Sunday in his SSR ZO6. Parson was .117 back in third, followed by Karl Loper’s steadily improving FFR GTM and former FTD Gary Hughes’ EMod class Bruton Stalker open-wheeler. On Sunday, Mike Moran reversed the tables in his eternal index-racing rivalry with Casey and nosed his BS Corvette to the PAX win. Six Keystone State entrants scored Top Ten overall runs during the weekend, a high water mark for Pennsylvania drivers since the very early days of the airport autocross series. 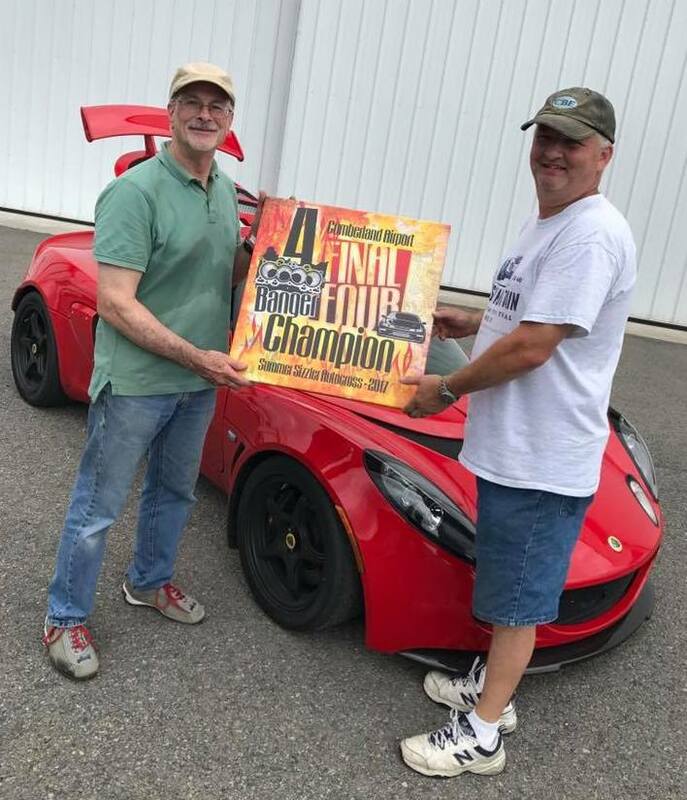 Double weekend winners in contested classes included Daniel Hill in SS, Larry Casey in AS, Mike Moran in BS, Jeremy McCauley in CS, Smooth Jim Harris in DS, Eric Coffman in GS, Chris Reilly in STX, Ray Schumin in STR, Elizar Mann in DSP, Matt Parson in XP, Jay Parsons in DP and Matt Felten in BMod. I’M NOT DONE YET A field of 120 energized entries over two days of frigid temps generated their own heat at the reunion series-ending Pumpkin Carve Cumberland Airport Autocross. Wade Chamberlain from Warrenton VA and Mike Moran from Fairfield PA surfaced as the main defrosters. Chamberlain claimed two more FTD wins and another one of Cumberland’s trademark shoot-out trophies while Moran fended off all comers in the PAX performance index both days. Saturday’s cold was mixed with occasional light showers, but the two-group, two-session format afforded all comers some dry time trial windows. With an eye toward qualifying for the post-race shootouts, Chamberlain, August FTD Larry Casey and Moran logged Top 5 Overall passes, joined there by potentially litigious six-banger pilot Gary Hughes and many-time CBE FTE Matt Felten’s Reynard – six-tenths behind Wade. V8 Shootout qualifiers among GM powered cars were Casey, Moran, Andy Thomas and Gary Miller, all in Vettes. Among Ford qualifiers, Chamberlain, Tink Phillips and Paul Przyborski were comfortably in. The last Ford spot was hotly contested down to the last run of the regular competition. Ben Lambiotte willed his Daytona Coupe past Smooth Jim Harris in the middle of the last rotation. Harris was not done yet, however, and generated a pass good enough to claim the spot back, only to literally clip the last cone on the course, confirming Lambiotte among the Great Eight. The Four Cylinder Final Four Shootout title went to popular WDCR class racer Danny Kao in a showroom fresh 2015 Miata over Virginia Honda driver Ray Schumin in the final. The V8 brackets delivered on their promise of strong performance as Chamberlain and Casey whittled their way down to an epic final match up. Casey ran his best pass of the day, in the 43.9 range, forcing Chamberlain to get close to his FTD number (near 43.6), which he did. With 2015 in the books, the CBE Assassin’s reign continues. Sunday dawned even colder, but the usual suspects were not phased. Chamberlain, Felten, Moran, Hughes and Gary Miller filled the Top 5 overall. A number of drivers snagged two-day wins in contested classes, including Chamberlain (Cobra FFR) in XP, Moran (Corvette C5) in BS, Dan Whiteman (Porsche 911) AS, Jim Harris (Mustang) FS, Elizar Mann (Toyota) ASP, Sean Halloran (Trans Am) CP, Greg Keller (Honda) EP, amd Gary Miller (Z06) SSM. They’re not strangers to all this. Before they became Cumberland’s Murder’s Row – #18, #20, #22 and #28 – the Capital Area Cobra Club guys built cars with specific intent to compete at this airport. In the early days of Cumberland autocrossing, they pitted their skills against the daunting tradition of the Steeltown Corvette Club and the swagger of the Chesapeake PCA. And won. They moved on to the SCCA. And they win there now. On paper, it’s no surprise that Larry Casey, Wade Chamberlain and Tink Phillips rocked at the Harvest Moon Reunion Autocross. But they don’t run CBE on paper and this weekend was as epic as any in Cumberland Airport history. Mighty Casey and his V8 brethren put on a great show. Saturday started rainy – very rainy. Mike Moran’s Solo Nationals trophy fresh Corvette C5 led after the aquatic first heat. Keystone state ace Matt Parson paced a drying second in an LS3 powered Miata and was the FTD leader at the lunch break. From then on, the day got drier and drier despite a forecast that said the opposite. By the last heat, the tarmac was effectively a dry track. 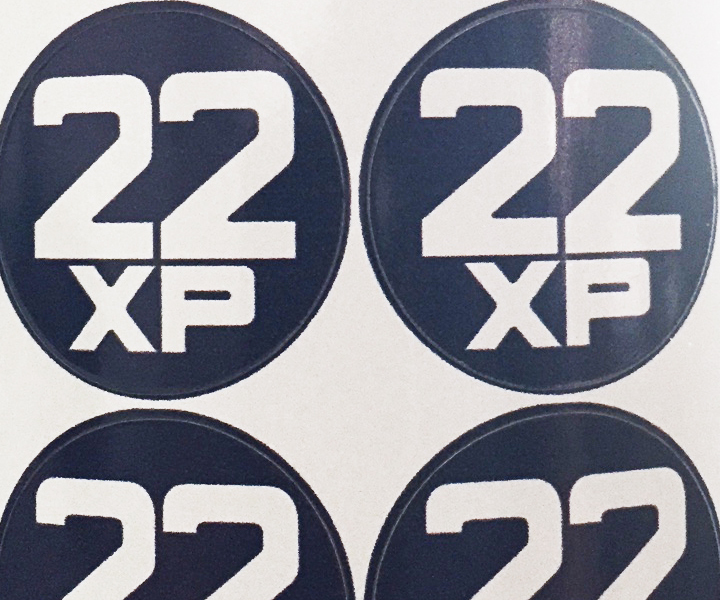 Tink Phillips caught fire and nosed his #18 Daytona to the top of the overall and the top of XP – albeit briefly – before Wade Chamberlain unleashed a trademark pass that left workers scrambling and mothers on Cabana Row grasping for their children. Wade was now in the low 47-second range. Just two cars later, Larry Casey, a wily veteran of many such CBE battles over the last decade, suddenly surfaced only a tenth behind. As Group 2 reached the final frame, Chamberlain ripped off an ethereal 45-second run but couldn’t keep his tail under him and coned. With the assembled congregation focused on one car, Casey came to bat, nailed a walk-off 46.075 home run and fist-pumped down the grid with FTD secure. Chamberlain, slightly stunned, was second, Phillips a best-ever third, Parson a workmanlike fourth and Cumberland fixture Ken Bane continued his strong year, finishing fifth in a wicked Miata mod. On Sunday, being Larry, Casey opted to go to Frostburg and drive with Andy Thomas in the gravel with the WDCR Rallycross clan. Being Wade, Chamberlain did not miss a beat and dominated the FTD spot all day under cool and dry conditions. Tink Phillip’s “Best.Weekend. Ever.” continued with a second place overall, some 1.7 seconds behind. After them, a rising tide of new front-runners showed the promise to lift all boats – with the Chris Fritz SM Subie, Bane’s SSM Miata and hired gun Paul Przyborski in the BDC rounding out the Top 5. Paul’s Reunion Sunday performance was his best at Cumberland since winning the CBE Pax Shootout many moons ago. What a shock (said no one ever) that Larry Casey and Mike Moran, both recent trophy winners at the SCCA Pro Solo Nationals two weekends ago, split the weekend PAX honors. Two day winners in contested classes included Chamberlain in XP, Ken Bane in SSM, Gary Hughes in SS, Jim Harris in FS, Mike Moran in BS and Greg Keller in EP. The weekend’s events where enhanced by the participation of NCCC and Bel Air Corvette Club racers and an impressive garage tour of a local automotive enthusiast’s unique workshop. Registration is now open at myautoevents.com for the October 17/18 Pumpkin Carve Reunion, the final weekend on the 2015 Cumberland Autocross Reunion Tour.